UEL Physiotherapy students received some royal approval as they tended to weary runners at Sunday’s London Marathon. The nine students were working at the finish line in The Mall when they were joined by Prince Harry, who was attending the event as patron of the London Marathon Charitable Trust. The prince thanked the students for all their efforts before posing for a group photo. 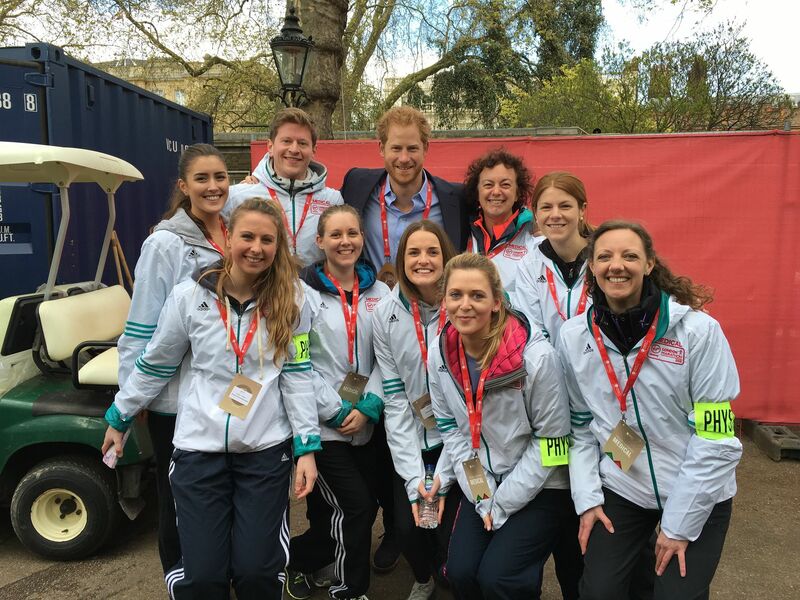 “It was a great honour to have the opportunity to meet his Royal Highness Prince Harry,” said Liz Nicholls, Programme Leader of the BSc Physiotherapy course. “In fact, it was a great day all round. It was really busy as always on the finish line but an excellent learning opportunity for our final-year students. Under Liz’s supervision, UEL physiotherapy students have been supporting runners at the London Marathon for the last six years, providing a valuable service for those taking part and gaining valuable hands-on experience of a mass-participation event. Students studying on UEL’s BSc Sports Therapy programme are also regulars at the marathon, and this year they were on hand to support athletes running to raise funds for Barnardo’s, Bliss, Cardiomyopathy, and the ABF Soldiers Charity. Michael Cole, Programme Leader for Sports Therapy, said, “Working at the largest sporting event in the world is incredible for our students as they get real experience giving runners post-race recovery advice and soft-tissue therapy and get to be part of an unforgettable day.